Seismic Signs serves all of San Diego County from our headquarters based in Poway, California. We are a part of the Signworld organization, a nationally recognized alliance of over 300 independently-owned sign companies in the United States and Canada. Our affiliation with Signworld allows us to take on corporate projects that have multiple national or international locations and leverage preferred group discounts on wholesale materials so we can provide competitive prices. Seismic Signs can meet a requirement to go green with the HP Latex 365 printer which uses water-based, odorless and solvent-free inks. It is certified for reduced environmental impact (UL ECOLOGO) and low chemical emissions (UL GREENGUARD GOLD) and it produces higher quality results on materials that don’t require an extra coating. 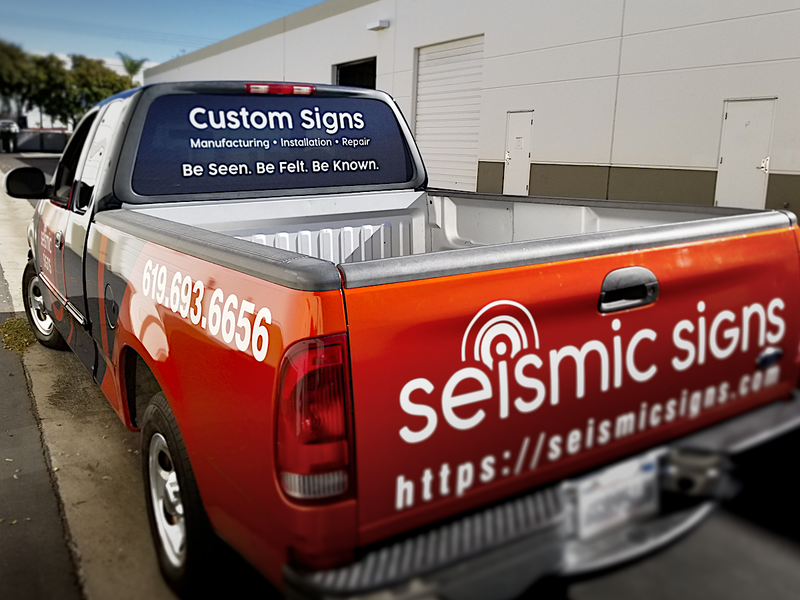 Although Seismic Signs is shiny and new, our team has over 30 years of experience in the sign-making industry; creating and installing banners, vehicle wraps, wall graphics, cut vinyl, exterior and interior signs, and providing site surveys and permits. We believe in building relationships, not just selling products. We want to work with you to meet or exceed expectations over and over again. Over 22 years of manufacturing and operations in high tech industries means that Seismic Signs uses highly efficient, quality-controlled processes to deliver orders on time, according to specifications, and within budget. We take great pride in our workmanship and do whatever it takes to make sure we only provide professional results. We also use Xrite's i1Publish Pro color management system for consistent color quality throughout design, proofing, and printing. Seismic Signs also has over 25 years of experience in professional graphic design, including 18 years of in-house design and marketing for corporations and startups in the technology and software development industries. We have a wide variety of skills and knowledge that also includes seven years of retail custom framing with a specialty in shadow boxes, doing canvas wraps, and mounting posters. Our passion is in creating works of art and professionally presenting them. We love coming up with creative and unique solutions for signs or exhibits using a variety of materials such as wood, metal, fabric, plastics, and digital media that allow us to go beyond the box and bring imagination to life. Seismic Signs strives for service excellence by responding to customers promptly and thoughtfully; first by listening to, then addressing their needs and concerns. We will use our expertise to solve and avoid potential problems. We will provide product excellence by matching the highest quality materials to the available budget, and the best workmanship with close attention to detail and strict quality controls. Finally, our goal is to reach maximum efficiency through repeatable and sustainable manufacturing processes, precise inventory control, accurate pricing, and team productivity.